Conservator John Mumford doing conservation work on Codex Sinaiticus at The British Library. 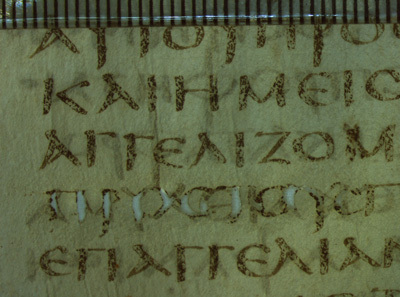 A major part of the condition assessment of Codex Sinaiticus involved the recording of features related to scribal activity. The fields of investigation included: variances of the ink’s colour between the textual and the paratextual elements (i.e. corrections/additions, squiggles, quire numbering…); pricking and ruling; surface treatment (pouncing). In order to plan future conservation and preservation strategies for the Codex Sinaiticus, particular attention was given to the condition of the different writing media. This report offers the results of the assessment carried out on the British Library portion of Codex Sinaiticus. The condition of the various inks used is illustrated by means of macro and detailed microscopic images. 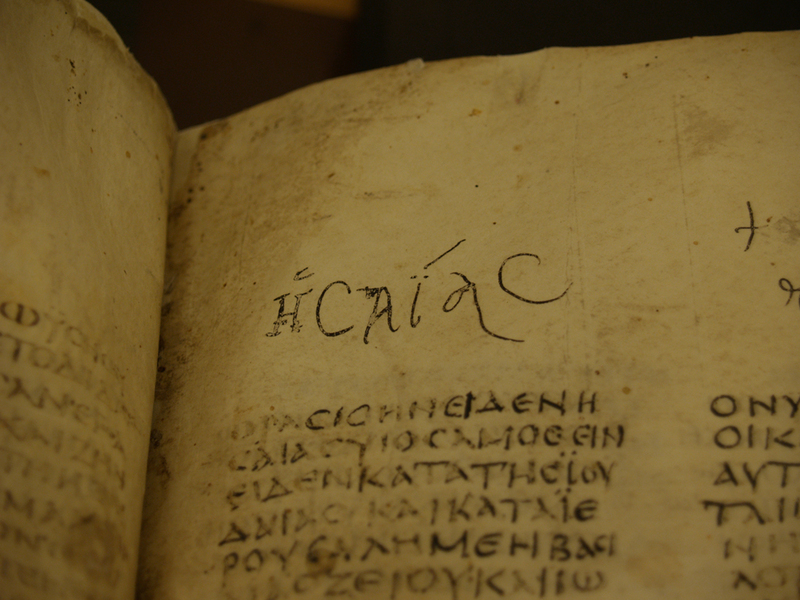 An attempt will also be made to compare the different media visually, in order to support the palaeographical studies. The results presented can also serve as a reference tool for future scientific analysis. The exact composition of any ink cannot be guessed just by means of a visual examination; however, some of the inks’ properties can reveal interesting information and help the general classification of the writing media. This examination will focus on the following selected properties: the thickness or thinness of the writing medium, its resistance to fading and flaking as well as the homogeneity of its distribution on the support. Observations on the interaction between the media and the writing support can be important and provide information on the nature of the inks. Other characteristics observed are: the colour; the intensity of the colour and the brightness. The colour will only serve as a general indication. It cannot be used on its own to discriminate between scribes because the observed differences may be due to various causes. The observations and the data gathered will be compared, highlighting differences that could be helpful to distinguish and identify various inks. The appearance of the various writing media is described and illustrated by means of digital images taken under standard light conditions. Some of the features are shown in detail by means of microscopic images. 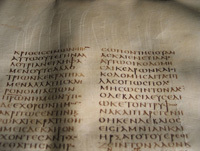 Many of the practicalities of the work carried out in the scriptorium where the Codex Sinaiticus was produced are not known. It is very difficult to establish whether the ink for the text was produced and provided for the whole scriptorium or if each individual scribe was responsible for making his own ink. Scientific analysis may help to find out what the ingredients are and in what proportions they have been added, but this may not be significant to determine working habits within a scriptorium. The same ink recipe may have been agreed or shared between the scribes in order to reach consistency of appearance of the written text. Some inks may be more or less diluted, for example, to better suit the writing tool, the support or simply the scribe’s taste. The physical characteristics of an ink may therefore vary from one scribe to another. Within the class of writing ink known as iron gall, for instance, the colour as well as the physical properties may vary according to: the type and proportions of ingredients used (e.g. gall nut, myrobalan fruit or bark; copper or iron sulphate...); the procedure for preparing the medium (e.g. boiling gall nuts or simply crushing them and soaking in water); or the additives (e.g. gum Arabic, sugar, honey...). Using tannins deriving from bark rather than from gall nuts may give a reddish tone to the ink. Intact gall nuts, with the insect developing inside, supply an ink richer in tannins than one produced using gall nuts where no insect is left. 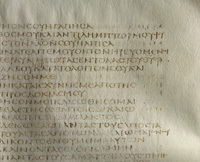 In 1862 Constantine Tischendorf published the first facsimile of Codex Sinaiticus. In the introduction (Prolegomena), he presents the results of his studies on the manuscript through which he was able to identify four different scribes in charge for writing the portion of Codex Sinaiticus that survived until today. Kirsopp Lake also had the chance to study the manuscript in depth and took pictures of the Codex leaves. He produced two facsimiles (one of the New Testament in 1911 and one of the Old Testament in 1922), this time including the fragments from Sinai brought back to Russia in the 1850s by the Archimandrite Porfiri Uspenski. While developing the glass plate negatives of the leaves, Kirsopp Lake noticed a difference in the way the inks were reacting. Some of them would take longer to appear, suggesting differences between the media. However, he does not provide any further explanation, but the difference of “behaviour” and “reaction” of the writing media may indicate a variation in composition (or proportions) of ingredients used to manufacture the inks. Kirsopp Lake therefore already had some understanding of the various scribes involved in writing the Codex Sinaiticus and, with further studies, he agreed with Tischendorf’s results. Milne and Skeat’s analysis of Codex Sinaiticus in the early 1930s confirmed Tischendorf’s identification of three scribes, but not the fourth. They identified Scribe A, Scribe B and Scribe D, assigning to D the Poetical Books in the Old Testament, previously assigned to C by Tischendorf. Only a few references are left today regarding the use and manufacturing technique of writing inks in ancient/classical times. The ink was known in China since 2700-2600 BCE. However, the first recipe found in a Chinese manuscript only dates back to the 5th Century BCE. Some information about the inks used by Greeks and Latins are available in the literary work of Pliny the Elder, Martial, Dioscorides and Vitruvius. Another reference relating to the preparation and use of inks is present in the Leyden Papyrus, written in Greek in the 3rd century BCE. Carbon and metal tannin are the two most common and widely used types of inks. Within each of these two groups there are innumerable different combinations of ingredients to be mixed in various proportions. Particularly in early times, some elements of both types of media were mixed together, in order to take advantage of the best qualities offered by each of the two classes of inks. Thanks to their characteristics, carbon inks and metal tannin inks have survived, as writing media, over the centuries. From about the 3rd century BCE (first dated references to iron gall inks) to about the 12th-13th centuries, carbon inks and metal tannin inks were widely used. 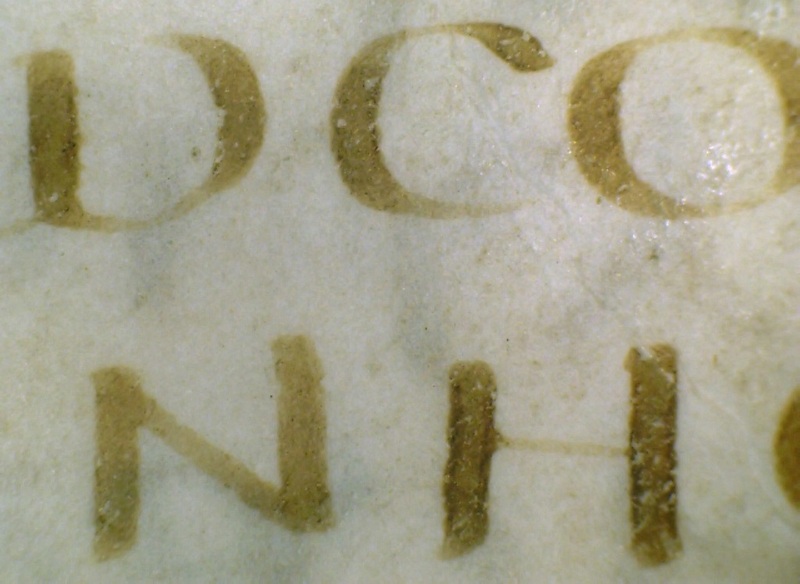 Later carbon inks were almost completely discarded by the western scribes because they were not considered to be as resistant as metal tannin inks, especially on parchment. Metal tannin inks, despite the progressive changes in recipes and ingredients, were commonly used up to the early 20th century. The Codex Sinaiticus inks have never been chemically characterized, and the type and proportions of ingredients mixed together have never been determined. Therefore, the composition of the writing media can only be roughly guessed by observing their visible characteristics and their degradation patterns. 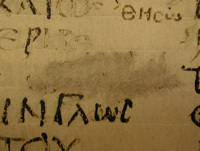 Douglas Cockerell, who repaired the portion of Codex Sinaiticus bought by the British Museum (now the British Library) in the early 1930s, observed the corrosion of the parchment support in some areas of the text and suggested that the brown-black inks used for the main text may be iron compounds. Kirsopp Lake did not find any particular feature in the brown-black inks used in Codex Sinaiticus, describing them as being of the usual sepia colour commonly found on ancient manuscripts. In the introduction to the New Testament facsimile, he also makes the assumption that there was a single type of ink in the scriptorium that was used by all the scribes. Tischendorf provides more detailed information, particularly in regard to the various colour shades of Codex Sinaiticus inks. According to his observations, the ink more widely used in the manuscript is of a dark colour, another of the inks used is dark, but with a subtle ashy shade, a further ink can be said to be reddish while another is shining dark. He also observes inconsistencies in the ink permanence. 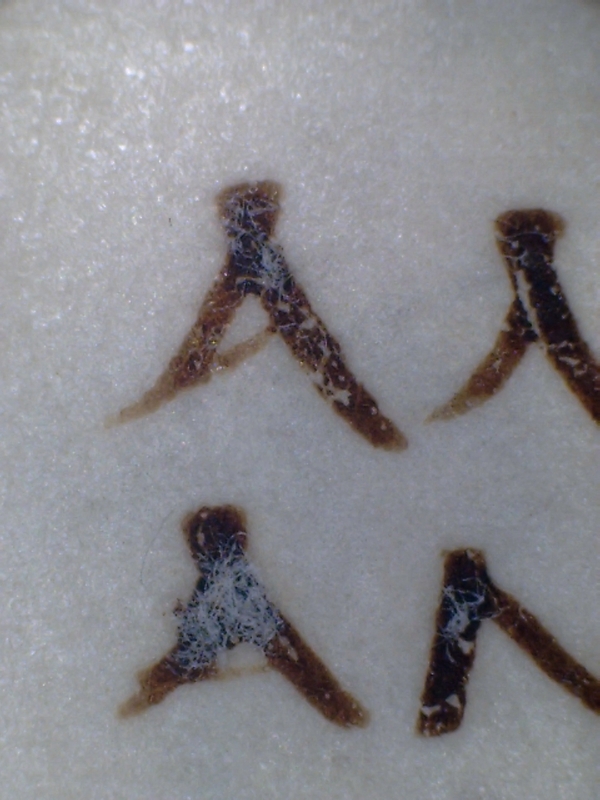 The different adhesion of the inks displayed on the hair and on the flesh side of the parchment, for example, is very noticeable. This characteristic seems to suggest that the nature of the writing support also influences the appearance of the writing medium lying on it. After more than 1600 years, it is clear that the quality of the writing medium originally used by the scribes was truly exceptional, as is the quality of the parchment. The ingredients appear to be well balanced creating a smooth and thin fluid perfect for writing on parchment. The recipe and the manufacturing technique seem to be exquisite too, revealing high craftsmanship and skilled experience for producing good quality inks. No significant degradation process seems to affect the writing media. Red ink has been generally used to highlight areas of the text, such as the superscriptions and numbering to the individual psalms in the Old Testament or the Eusebian apparatus of the New Testament. Tischendorf referred to this medium as minium, probably only meaning ‘red pigment’ rather than a specific chemical compound. Kirsopp Lake also mentions the red ink used, naming the pigment vermillion, and including the New Testament quire numbering in the text considered. Milne and Skeat too named the pigment used for the red text as vermillion. They also noticed the retracing of the letters and assumed that the original medium had faded. However, the red pigments examined do not show signs of fading. The variation of colour intensity is probably due to differences in the dilution of the writing medium. It is possible that these differences made the text more difficult to read, which may explain the need for retracing. 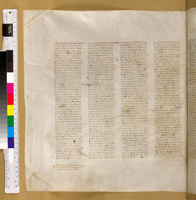 Quire numbers are marks generally placed at the beginning or the end of a section to help maintain the right sequence of text in a manuscript. 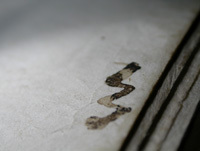 In Codex Sinaiticus, these marks appear, written in Greek numerals, on the top left side of the first folium on each quire. They are also repeated at the top right side of the same folium. Tischendorf suggested that the number on the left is the original, while the one on the right may be a later addition of the 8th century. 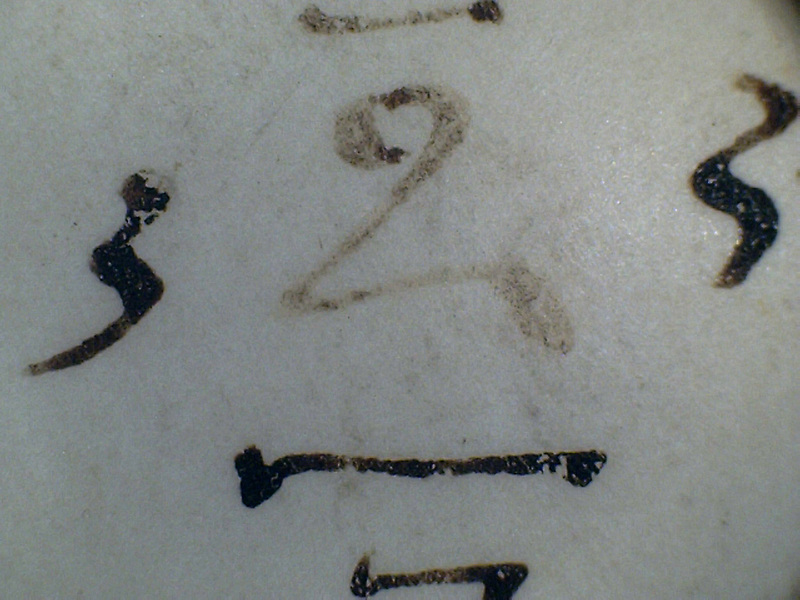 It is not clear who wrote these numbers or when in the history of the manuscript they were written. However, it is possible that they were placed before the text was written in order to help the scribes calculate the distribution of their text. It is also possible that they have been added after the text was written, in order to assemble the sections correctly, before the book was bound. The numbering is continuous from the Old Testament to the New Testament. However, the ink used for the Old Testament quire numbers and the one used for the New Testament have a different appearance. For this reason, they will be examined separately. 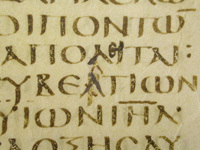 The ink used for the Old Testament quire numbering has a “yellowish” shade. It is quite fluid and smooth, and not very thick. The distribution of the ink on the surface is even. The quality of the ink is good. It adheres well to the parchment and is not affected by any particular damage, other than the few partial or complete trimmings, minor ink loss and abrasion of the surface on the more exposed areas. In two sections (Q41:1r and Q43:1r) the numbers have been retraced with a darker ink, which appears thicker and more concentrated. 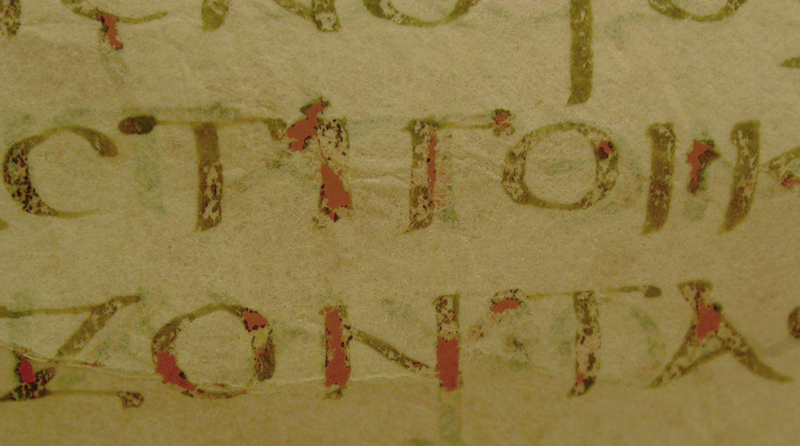 The adhesion of this medium to the parchment support is not perfect, and minor ink loss is visible. It is important to understand when the retracing happened, what ink was used and if this has been applied on other areas as well (such as the squiggles, the main text or the secondary quire numbering). This information could give clues about different episodes in the history of the Codex. 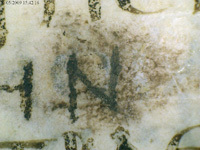 The distribution of the ink on the surface and the colour of the New Testament quire numbering appear completely different from those examined in the Old Testament. This particular medium is darker, of a red shade and, despite being fluid, the distribution of the ink is not particularly even throughout the surface, causing larger deposits of liquid and darker areas. The quality is very good and there is no evidence of degradation, other than some minor ink loss. Many of the numbers have been partially or completely trimmed off in the past, possibly as a result of one or more re-bindings. Those still visible, appear partially or completely erased, revealing a need for correction. However, the correction was never made leaving many questions open in regard to when, why and by whom the erasure may have been done. More questions and doubts are also raised in regard to the reasons and the circumstances determining such differences between the quire numbers in the Old Testament and those in the New Testament. Were the two sequences written in the scriptorium by the same scribes responsible for the text or by another individual? Was the Old Testament written and then the sections numbered using the ink available in the scriptorium? This could, for instance, imply that the New Testament was written either before or after the Old and another supply of ink was prepared which has resulted in the visual and physical differences between the writing media. This change in ink colour and characteristics is, however, not reflected in the scribes’ work, leaving doubts on the possible interpretation. Scientific analysis of the different inks and a comparison of the results may be of much help to clarify these and many other issues. The more recent sequence has been written with a much darker and less fluid ink, compared to those of the primary numeration. The adhesion to the support is not as good as the earlier inks, but there are no major damages and all the numbers are still perfectly visible and legible. As opposed to the primary numbering, this secondary quire numbering runs from the Old Testament to the New Testament without a change of ink. Moreover, for a number of quires, the two marks differ from each other (the primary numbering counts one section more than the secondary) providing evidence of a significant change that happened to the manuscript at some stage of its history. According to Tischendorf, Kirsopp Lake and Milne and Skeat, the secondary numeration was added in the 8th century. Is there any correspondence between the writing medium used for the quire numbering, the one used for the squiggle and one of those used to retrace the original text (maybe retracing ink no. 2?)? Assuming the book was bound soon after its completion, the need for a second fasciculation may imply that the book was disbound at some stage and reassembled according to the new sequence (one section less than the original). What determined the binding or rebinding of the book? Was the original binding and/or the manuscript damaged and therefore in need of a new binding? Currently there is no answer to all these questions. It is hoped that future scientific analysis may help us to understand more fully the many issues related to Codex Sinaiticus. The “squiggle” is a mark placed on the inner side of the central bifolium of each section. The mark is first drawn on one of the pages (generally the right), and then the bifolium closed on itself so that the offset will appear on the facing page. 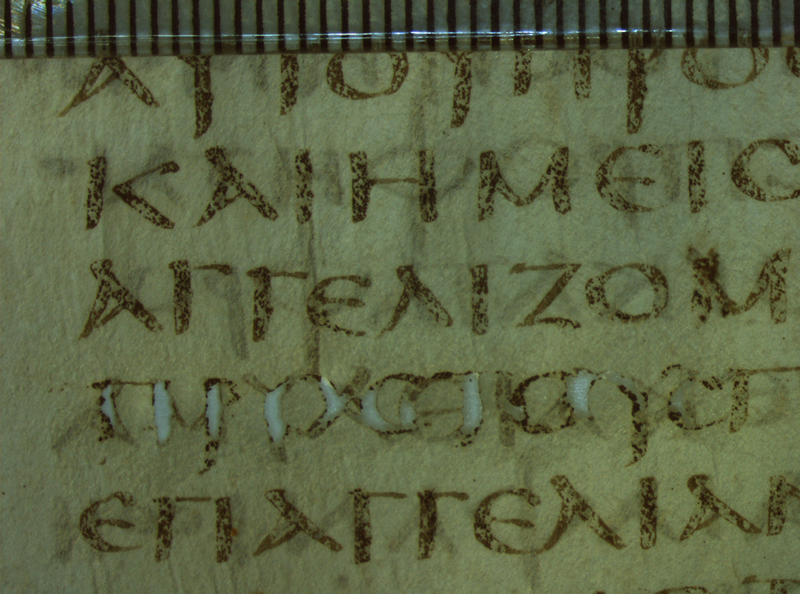 The recent investigation, carried out as part of the Codex Sinaiticus Digitization Project, has identified a retracing of the fore-edge squiggle, never noticed before. A darker, rougher and heavier ink covers the original medium that was probably used to draw it for the first time. 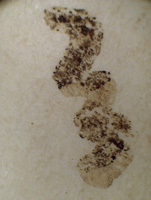 This layer of ink is thicker than the medium previously used and tends to display a craquelure effect on the surface and other mechanical damage, such as minor ink loss. The appearance of the medium used for the retracing of the squiggle resembles the ink used for the secondary quire numbering. 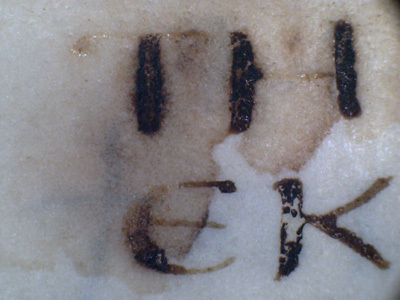 However, the appearance of the ink underneath the retracing, although difficult to see undisturbed, is similar to ink used for some small notes that are visible, for example, on Q68-f5r. These last observations are only based on a visual examination and ought to be verified by means of scientific analysis. An observation of the squiggle marks raises more questions in regard to their appearance and use. What is the relation between the squiggle and the secondary quire numbering? Is the ink used for the retracing of the text similar to either of these two inks? According to Dirk Jongkind, the squiggles were made at the same time as some corrections dated between the 5th and the 8th century. Milne and Skeat date the secondary quire numbering is to the 8th century. Therefore, there could be a correlation between the retracing of the squiggles, the retracing of some areas of text, some corrections and the secondary quire numbering. However, no certain conclusion can be reached without a chemical characterization of the writing media. Was the squiggle done in the scriptorium? Was it done in the bindery? Was it done in the scriptorium but at the binder’s request? Answers to these other questions may give hints concerning how the work was organized and if the scriptorium and bindery were independent (possibly in different areas of the monastery) or if they were more closely connected. Observations in this regard could help us to better understand the production of the book and to identify different periods in the history of the Codex. Furthermore it may also uncover more information about the place of origin of the Codex Sinaiticus. 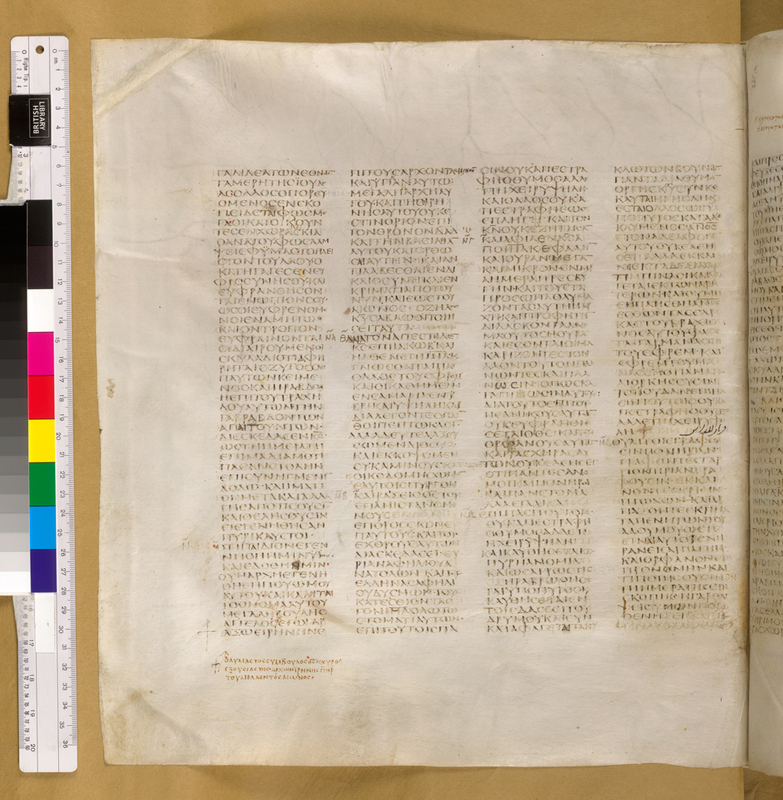 The amount of retracing, corrections and annotations visible on the Codex Sinaiticus suggests that the book has been heavily used in the past. Some of the corrections appear to be contemporary with the main text and written by the same scribes. Several inks have been used to correct the text or to add notes, all with different appearance and different characteristics. It is interesting to observe how close the additions/corrections are to the spine fold as this could give hints about the status of the manuscript at that time; whether it was bound or unbound. The retracing of the characters (main text, corrections, some quire numbers and some of the squiggles) was repeated several times throughout the history of the Codex Sinaiticus, always using different types of inks. Both the text in brown–black and the text in red have been retraced. The first retracing is not always clearly identifiable and the ductus can sometimes be misleading. 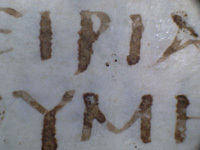 The ink used appears very similar (if not the same) to the original text and it is therefore difficult to understand when it has been done and why. The second retracing is more easily identifiable for several reasons: the colour, the appearance and the degradation of the ink. 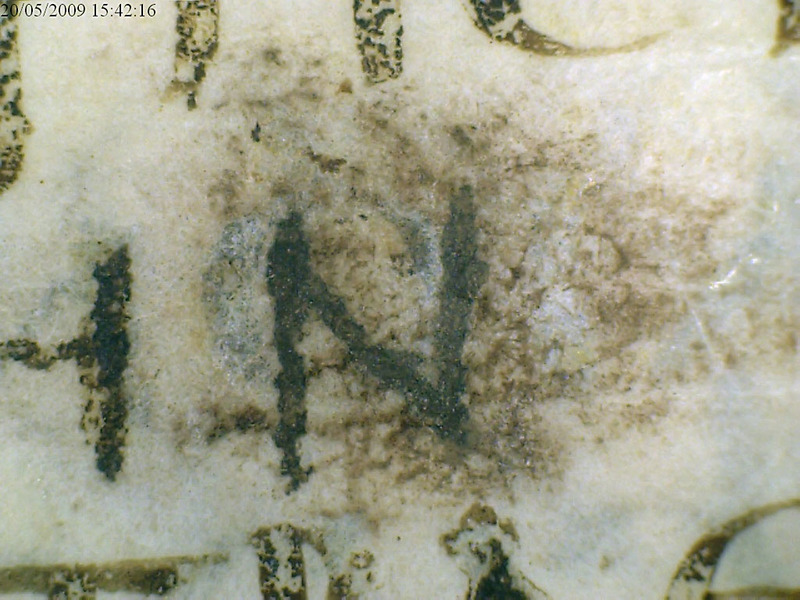 The reason for the retracing is not very clear, but probably it was caused by the ink loss of the original writing. 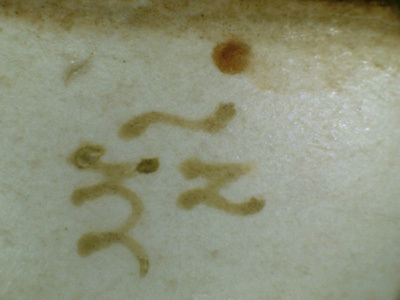 The letters have been retraced quite accurately, but in several places the retracing is visible either because of the ink loss in areas not already retraced or because the edges of the letters retraced are outside the original characters. The ink used to retrace the text seems to have also been used to retrace the squiggles and maybe some of the quire numbers. The third retracing is extremely easy to identify, because it was done with a very dark (black) and shiny ink. This medium shows characteristics close to carbon based inks. Moreover, the letters have not been retraced accurately and the edges of the original letters are still visible. 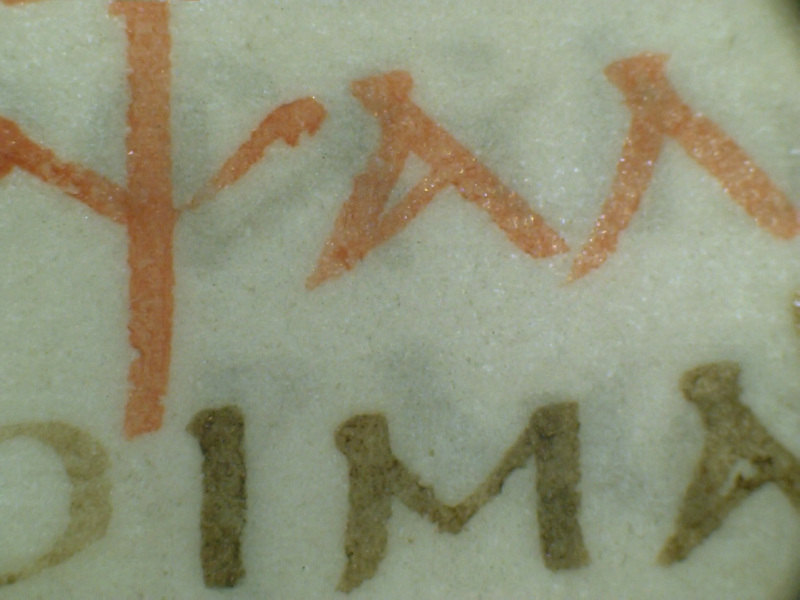 The retracing of the text in red is done with a darker and heavier ink which sometimes shows high light reflection. The annotations have been retraced with the same inks (2 and 3) used to retrace the text. In at least two instances (e.g.Q68-f5) the squiggle clearly appears to have been retraced with a thick, dark, brown-black ink. 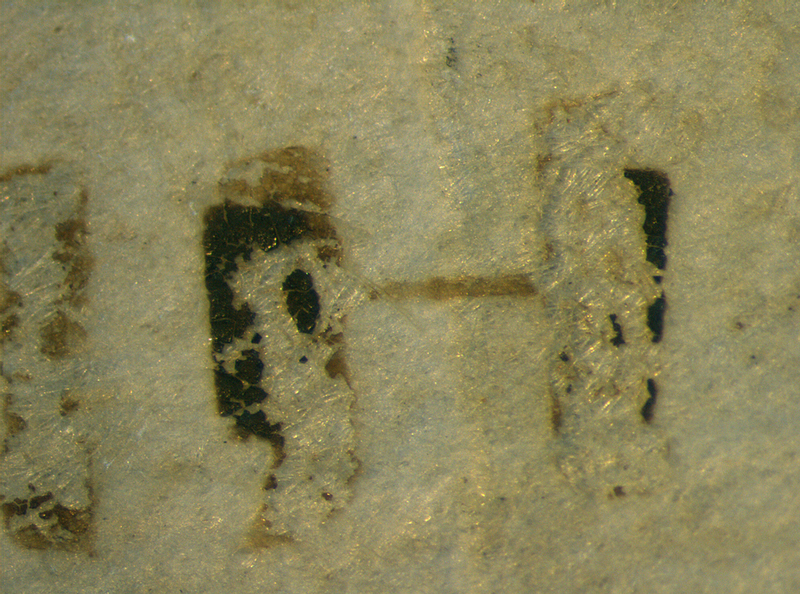 This medium shows properties similar to retracing ink 2: uneven distribution on the surface and a tendency to form heavy craquelure and flake off. The craquelure breaks leave an uneven and fragmented surface. The inks used for the titles are very finely written and, with few exceptions, are consistently light in colour. The quality and permanence of the media on parchment are excellent and display no damage or imperfection. Similarities can be found with those media used by the scribes to write the main text. Scholars have identified the same scribes of the main text as the authors of the titles. The condition of such an old manuscript was, and still is, considered remarkable and very little stabilization treatment was necessary. Nevertheless, it was felt that, for the first time, it was important to engage in a very detailed condition assessment which combines three major fields of interest: conservation, curatorship and imaging. 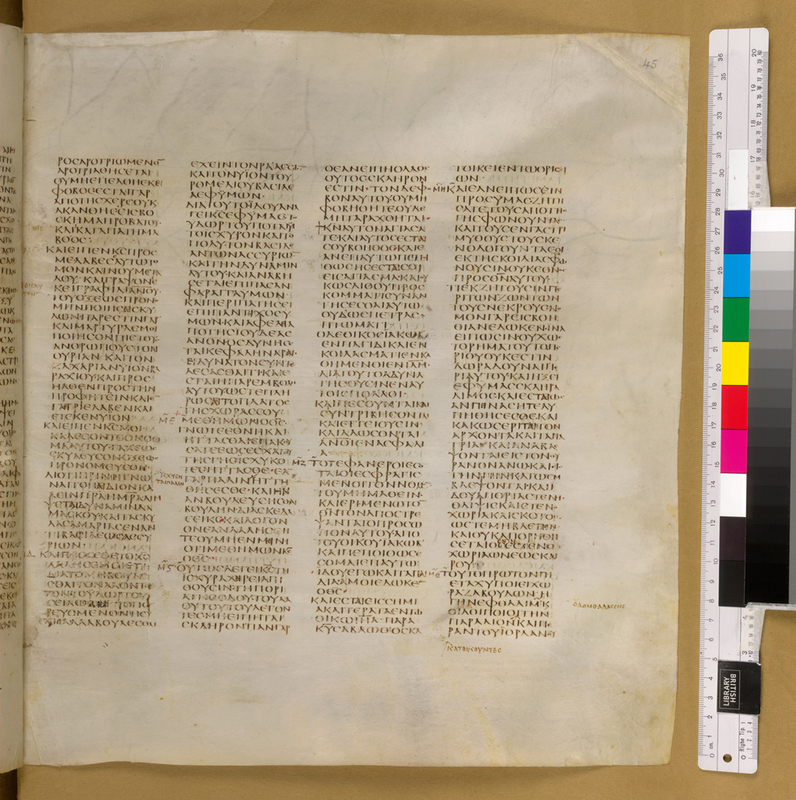 The categories chosen to gather general information about the inks of Codex Sinaiticus include: ink corrosion; ink loss; ink colour variances (between original text; substitution, overwriting, annotations, interlinear writing); ink offset. Other categories taken into account when the data were analyzed were: thickness of the parchment; presence and location of faint, small or marginal annotations; presence of fore-edge “squiggles” and surface preparation. In this section an attempt will be made to correlate the type of damage with the specific features of the Codex which may have influenced its severity. Very brief accounts of the condition of the inks have been given by Tischendorf and Kirsopp Lake in the introduction to their facsimiles. According to Kirsopp Lake, the ink corrosion was more pronounced on thinner leaves. The early accounts also mention the considerable ink loss and observe that this is more evident on the flesh side of the parchment. Milne and Skeat, who wrote about the “deplorable” state some of the most interesting and frequently consulted folia were, were certainly referring mainly to the ink loss. Both Tichendorf and Kirsopp Lake’s comments, however, refer to the whole Codex known at that time. As a result of the recent history of the Codex, the same observations may no longer be valid. The Codex is divided between four locations and the differences in the environmental history, or conservation condition, may have influenced the degradation of its leaves. The comparison of the condition assessment data between the four sites could potentially point out factors influencing the degradation of the parchment, as well as that of the inks. Ink corrosion is the “burning” of an ink through the writing support. This degradation process may be determined by several factors such as; the ink’s composition, bad environmental conditions or characteristics of the writing support (nature of the raw materials, manufacturing process, concentration and homogeneity of the final product and so on). The condition assessment recorded the damages and distinguished between minor ink corrosion and major ink corrosion. These general categories were aimed to highlight areas in need of consolidation or treatment and identify areas to monitor carefully in the future. Minor ink corrosion causes pinprick-sized holes which have not locally weakened the parchment. 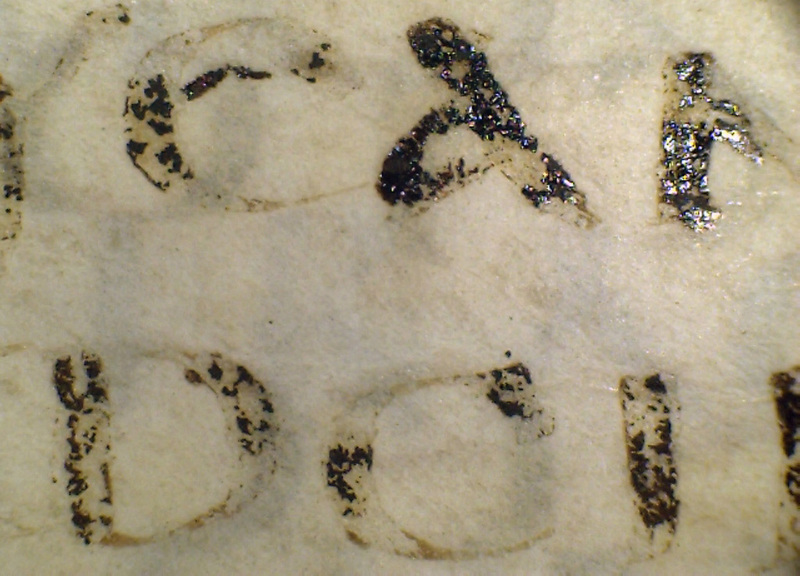 Major ink corrosion concerns larger areas of text and creates a weakening of the parchment support. 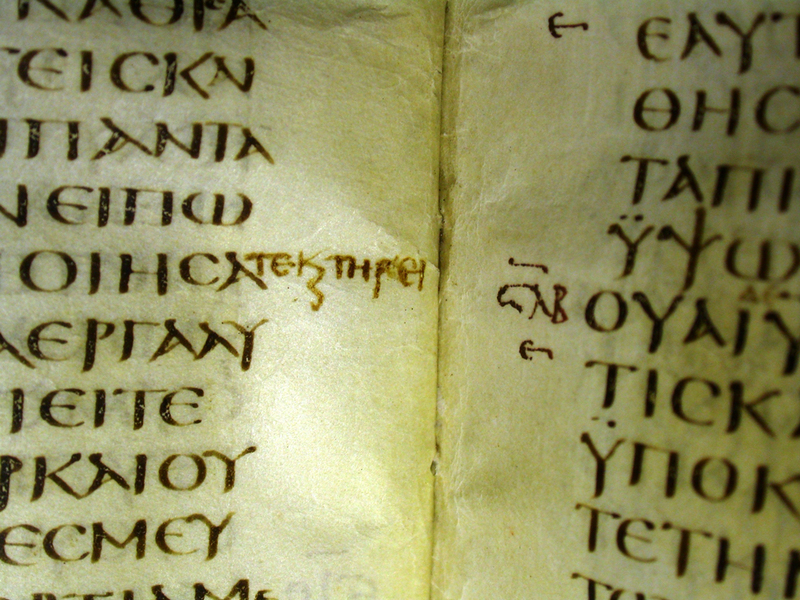 The portion of the Codex kept at the British Library shows very little major ink corrosion. 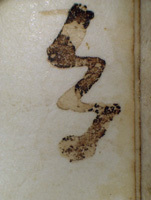 The ink originally used by the scribes appears to be in very good condition, and it is not causing corrosion of the support in any part of the text. 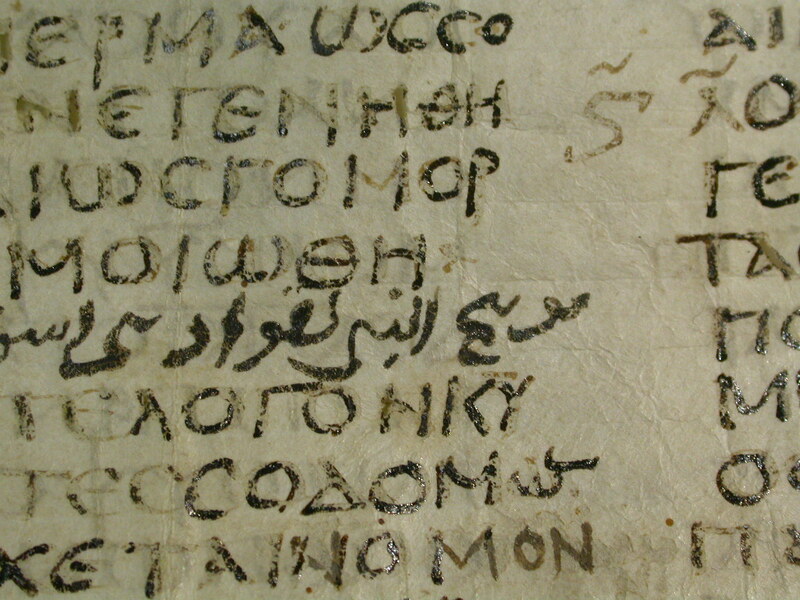 An in-depth examination revealed that the only medium burning completely through the parchment support is the brown-black ink used for the second retracing of the main text. Other inks, including those used for the corrections, have sometimes caused only minor etching of the parchment surface and have then flaked off. The thinness of the parchment folia has sometimes facilitated the corrosion of the writing support. However, on its own, this characteristic does not determine the corrosion of the writing support. Indeed, some very thin leaves have not suffered from this damage while some other slightly thicker folia display losses caused by the ink degradation process. The conservation conditions, the amount of handling, as well as a higher concentration or quantity of ink deposited on the parchment, may all be possible causes of damage. Furthermore, the way the writing support has been prepared can also determine the severity and the extent of such degradation. As already mentioned, the quality of ink used for the retracing of the original text played a major role in the corrosion. This may be the result of its ingredients probably being not well balanced, thus allowing the development and catalysis of the degradation processes. Major ink corrosion has sometimes caused weak areas: the most critical ones have been repaired by Cockerell. The silk gauze used by Douglas Cockerell to reinforce some of the weak areas is in excellent condition and so are the inks covered by it. 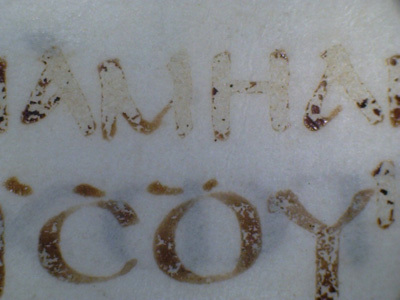 This confirms both the quality of the inks and the material and technique used for the conservation of Codex Sinaiticus in the 1930s. In some areas, old erasures caused a considerable mechanical weakening of the support and contributed to speed the corrosion. Ink loss on parchment can be caused by a number of reasons related to the ink itself or to external factors, such as the nature of the writing support or the mechanical stress (e.g. handling) suffered. 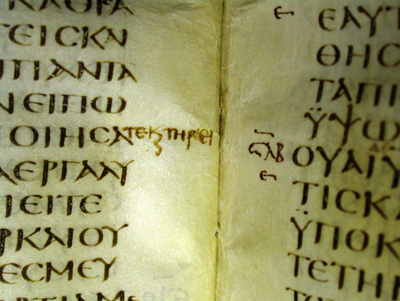 Ink loss on Codex Sinaiticus has been noticed by many scholars in the past, and particular attention has been given to the difference in permanence of the inks when applied on the hair or on the flesh side of the skin. 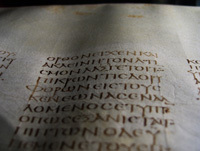 In the condition assessment of Codex Sinaiticus, the conservators have recorded the type of damage, distinguishing between minor ink loss and major ink loss. Minor ink loss is a partial loss of ink from characters in a text line. Major ink loss occurs when a larger area has nearly completely lost the ink. 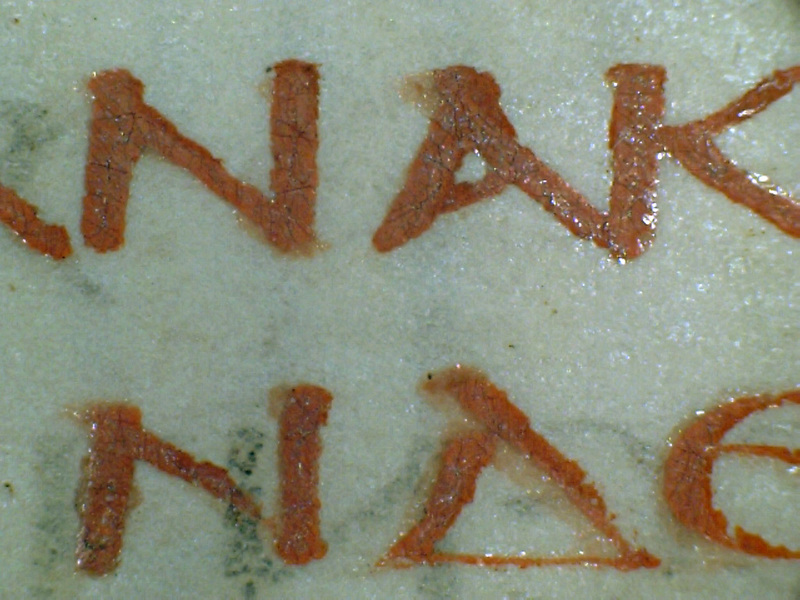 The brown-black media of Codex Sinaiticus are affected by ink loss, but the red inks are not, suggesting that the composition of an ink can influence its permanence and resistance to flaking. Large areas of the main text appear to have suffered from ink loss at various stages of the Codex’s life and with various degrees of severity. Sometimes, the whole page, or large areas of the text columns are affected, resulting in the writing being nearly illegible. This often happens on pages that have been written on the flesh side of the skin, implying possible correlation with the material characteristics of the parchment or the way it has been prepared. Sometimes, the treated surface of the writing support can make the adhesion of the ink difficult. 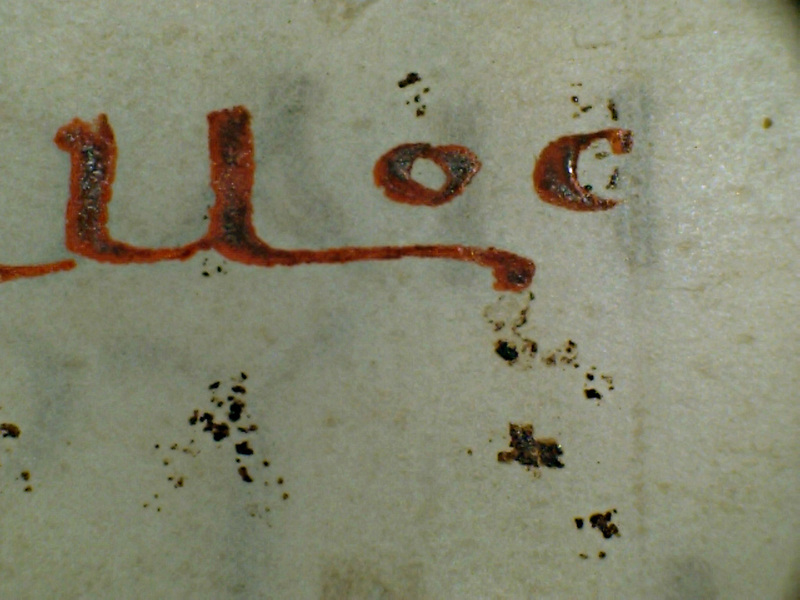 For example, on Quire 41-f1r (BL 30 recto), in those areas where there are irregularities of the skin, the ink has adhered firmly to the parchment, while the rest of the text has suffered from a considerable ink loss. The nature and composition of the inks can also contribute to the extent and the severity of the flaking. Variances in the characteristics of the writing media (e.g. lack of binding media), determine differences in permanence of the inks. The ink used for the second retracing of the main text, for example, appears to be more friable than the one used to write the original text, suffering from major ink loss. Mechanical damage to the parchment support (pleating, cockling, deformation, folds, water/other stains…) can also contribute to ink flaking. The partial or complete corrosion of the support caused by the ink can also cause friability and loss of the ink. The interaction of the many possible sources of ink loss can also lead to or speed up the degradation. On Codex Sinaiticus, major damage is mostly concentrated on the pages written on the flesh side of the skins and on textually important portions of writing that were heavily handled in the past. Typical examples are f.199v (end of Old Testament), f.200r (beginning of New Testament) and f.61v-62r (from Isaiah). 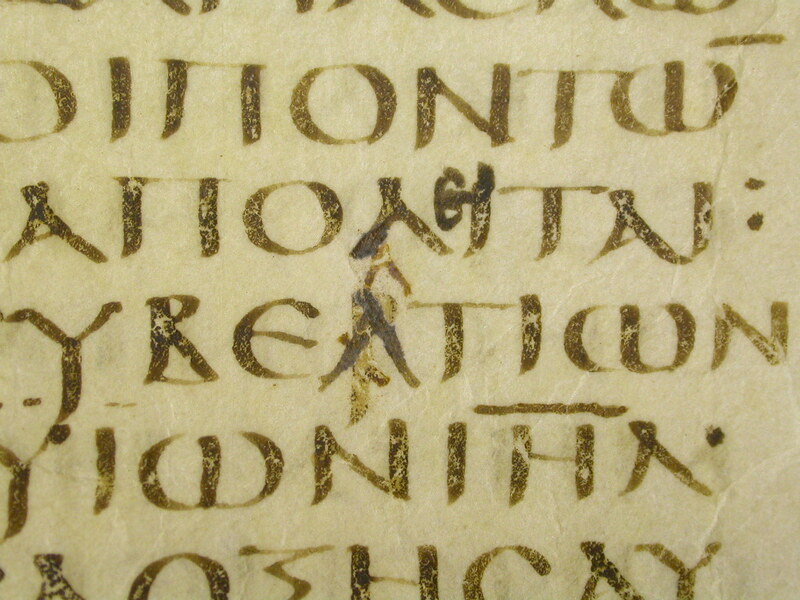 The ink on f. 61v-62r, as well as in other areas, must have suffered from losses quite early in the history of Codex Sinaiticus, as it has been heavily overwritten with a very dark and shiny ink (possibly carbon or carbon based ink). 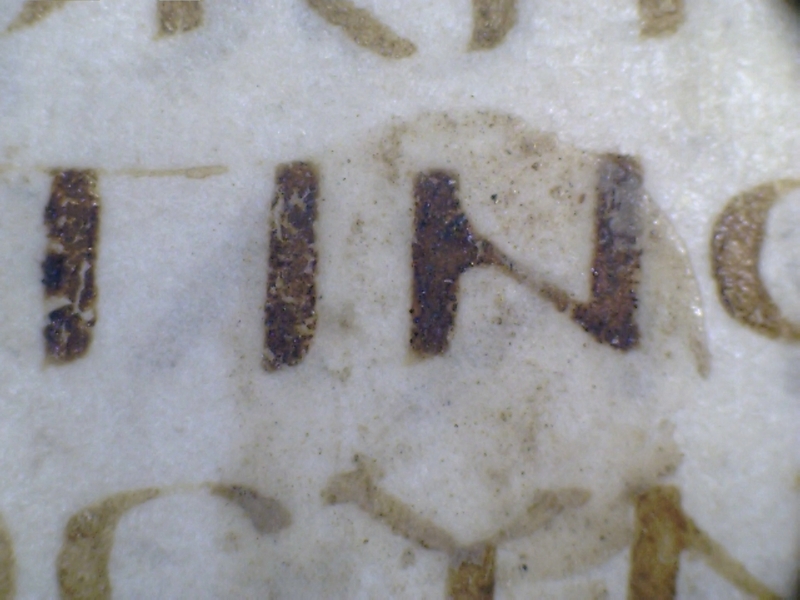 The losses visible on the flesh side of many bifolia affect both the main text and the corrections, suggesting that, in this case, the composition of the inks is not as critical as the parchment support preparation may be. The processes the skins undergo to become parchment are not the only treatments to determine the surface characteristics of a support. A good or bad surface preparation (pouncing) prior to writing can also influence the ability of the ink to adhere firmly to the support. 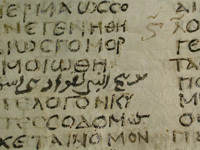 The scribes of Codex Sinaiticus have used different pouncing techniques; however there is no clear correlation between one technique of pouncing, a particular scribe and the amount of ink loss. Currently, the writing media of the Codex, examined under a microscope, do not seem to be flaking but look friable in some areas. However, during the condition assessment, minimal amounts of dark powder have been found in some of the gutters. This may be the result of some ink loss since the manuscript was bound. 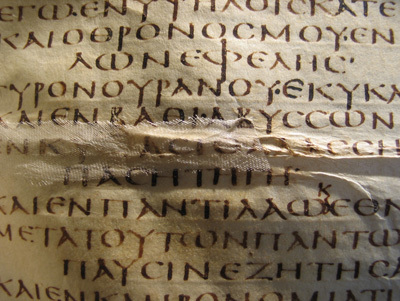 This information could determine which preservation/conservation measures may be chosen for Codex Sinaiticus in the future. Ink offset is defined as a transfer of ink onto a leaf from another surface. The fore-edge squiggles are not included in this section as it is a feature created intentionally. In his report, Cockerell mentions the partial solubilization of the inks affected by water damage and suggests that this could be the sign of carbon being present in the writing ink. In the report the areas or pages where the phenomenon is visible are not specified. In the recent investigation, there seem to be inconsistencies: sometimes the ink appears to be soluble sometimes not. It is still unclear what inks (the one used for the original text and the ones used for the retracing) are soluble and further investigations are needed. In a few occasions, deposits of wax or other unknown material were found on the text area. The condition of the ink in those areas is stable. Fibres, probably from paper or fabric, have been occasionally found stuck to some letters of the main text. It is possible, although not certain, that during the conservation treatment in the 1930s, the humidity applied by Douglas Cockerell to relax the parchment reactivated the binder present in the ink in some areas. After that, paper or felt may have come into contact with these areas while not perfectly dry, resulting in the accretion of fibres described. These fibres do not affect the readability of the text, neither are they causing damage or speeding any degradation process. Therefore, their removal is not required. 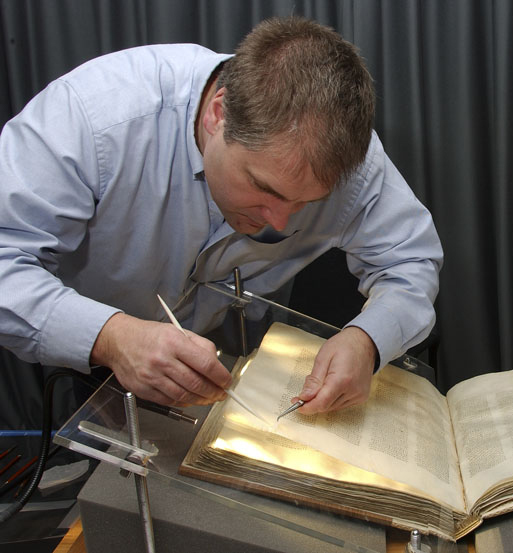 The visual examination carried out on the Codex Sinaiticus has highlighted areas of conservation and curatorial interest. The inks are slightly friable but in overall good and stable condition. Investigations on Codex Sinaiticus inks are ongoing, and more information is still to be discovered. It is hoped that it will be possible in the future to carry out scientific analysis using non-invasive in situ techniques, in order to confirm or modify current observations and theories.
] See S. LEHNER, Ink manufacture, including Writing, Copying, Lithographic, Marking, Stamping and Laundry Inks, London, Scott, Greenwood and Co., 1902 , pp. 6-7. See M. ZERDOUN BAT-YEHOUDA, Les encres noires au Moyen Age, Paris: CNRS Editions, 1983 p.13. See C. REMAZEILLES et al., Influence of gum Arabic on iron gall ink corrosion. Part II: observation on elemental analysis of originals, Restaurator 26, 2005, 118-133. See D. DORNING, Iron gall inks: variations on a theme that can be both ironic and galling , in Postprints of “The Iron Gall Ink Meeting Conference 4th & 5th September 2000” University of Northumbria, 2001, pp. 7-11. Quires numbers are placed at the beginning or at the end of each section to maintain the correct sequence of the text. 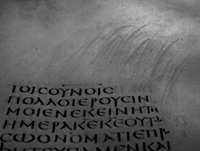 The squiggles are marks traced in the central bifolia of Codex Sinaiticus. Their function is most likely related to the binding of the volume (see D.JONGKIND, Scribal habits of Codex Sinaiticus, Georgias Press, 2007, p. 32). Iron gall inks, for example, change colour in time. Two inks prepared according to slightly different recipes may look of the same colour when the ink is fresh but look very different after a short or long period of time. D. DORNING, Iron gall inks: variations on a theme that can be both ironic and galling , in Postprints of “The Iron Gall Ink Meeting Conference 4th & 5th September 2000” University of Northumbria, 2001, pp. 7-11. C.TISCHENDORF , Bibliorum codex Sinaiticus Petropolitanus: Ex tenebris protraxit in Europam transtulit ad juvandas atque illustrandas sacras litteras edidit C. Tischendorf , 4 vols. St Petersburg 1862. K. LAKE, H. LAKE , Codex Sinaiticus Petropolitanus:the New Testament, the Epistle of Barnabas and the Shepherd of Hermas, Preserved in the Imperial Library of St. Petersburg, Clarendon Press Oxford 1911 and K. LAKE, H. LAKE , Codex Sinaiticus Petropolitanus et Friderico-Augustanus Lipsiensis: the Old Testament Preserved in the Public Library of Petrograd, in the Library of the Society of Ancient Literature in Petrograd, and in the Library of the University of Leipzig, Oxford: Clarendon Press, 1922. K. LAKE, H. LAKE , 1911, p. xix. The results of the analysis were partially published in H.J.M. MILNE, T.C. SKEAT with contributions by Douglas Cockerell, Scribes and correctors of the Codex Sinaiticus, London: British Museum, 1938. GAIUS PLINIUS CAECILIUS SECUNDUS, Naturalis Historia, Books XIV, XVI, XXII, XXVII, XXXIII, XXXIV, XXXV, XXXVII. DIOSCORIDES, De Materia Medica, Book V,96. The principal components of this class of inks are black pigment and a binding agent. The source of the black pigments may vary: lampblack, soot etc. Depending on the way the pigment is extracted or collected, the nuances will be different. The aspect of the ink is also strongly influenced by additives such as binding agents. The binding agents, used to keep the ink in suspension, can be of different natures: glucidic (gums), proteic (gelatins), or lipidic (oils). These media are not based on a chemical reaction but on a physical mixture: this influences greatly their appearance, characteristics and stability in time. Metal-tannate inks are produced by the reaction between an iron salt (possibly containing other metals) and plant extracts containing tannic or gallic acids. D. COCKERELL, Condition, repair and binding of the manuscript, in H.J.M. MILNE, T.C. SKEAT, Scribes and correctors of the Codex Sinaiticus, London: British Museum 1938, pp.79-80. See K. LAKE, H. LAKE, 1911, p. xvii. See C.TISCHENDORF, 1862 , p. 7. Minium is lead tetraoxide (Pb3O4) and it is also known as red lead. It was first mined in Spain near the Minius River from which it takes its name. It was used as a red pigment in ancient Rome and in medieval times. It has been widely used over the centuries as a pigment for manuscript illumination. See K. LAKE, H. LAKE , 1911, p. xvii. Vermilion is mercury sulphide (HgS) artificially created to imitate the native red compound named cinnabar. The very bright red colour is characteristic. Pure cinnabar was already known and used by the Romans. Pliny the Elder mentions its use and difficult sourcing in his Naturalis Historia. The earliest known description of the process to create vermillion (synthetic cinnabar) dates back to the 8th century. The names "cinnabar" and "vermilion" have been used interchangeably until the 17th century when vermilion became the more common term. H.J.M. MILNE, T.C. SKEAT 1938, pp. 34-35. C.TISCHENDORF, 1862 , p. 10*. Milne and Skeat have suggested that the primary numbering is the original one, although not inserted by the scribes of the main text, while the secondary sequence was dated to the 8th century H.J.M. MILNE, T.C. SKEAT 1938, p.7. Kirsopp Lake as well gives the same interpretation in his facsimile of Codex Sinaiticus New Testament. See K. LAKE, H. LAKE, 1911, p. xviii. 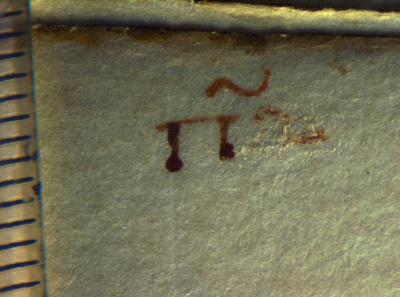 Tischendorf mentions the differences in colour between the ink used for the Old Testament quire numbering (“of a yellowish-brown “dirtier” shade”) and the one used for the New Testament (of a reddish colour). C.TISCHENDORF, 1862, p. 7. The trimmings may be the result of one or more rebindings. Milne and Skeat suggested that the erasures of the section numbers may have been done by the same person who wrote the secondary numeration. H.J.M. MILNE, T.C. SKEAT 1938, p.7. Milne and Skeat suggested the numbers could have been put there before the sections were written. H.J.M. MILNE, T.C. SKEAT 1938, p.8. There is no evidence that the book was actually bound soon after the writing and the corrections were complete. Amy Myshrall hypothesized that the book was never finished and was therefore left unbound for a long time. Unpublished PhD thesis “Codex Sinaiticus, its correctors and the Caesarean text of the Gospel” University of Birmingham, 2005. See D.JONGKIND, 2007, p. 32. Ductus is defined as the route followed by the pen to form a letter. See Q43, 1v (BL f.42v) Beginning of Isaiah and Q73, 1r (BL f.200r) beginning of New Testament. D.C. COCKERELL, Condition, repair and binding of the manuscript, in H.J.M. MILNE, T.C. 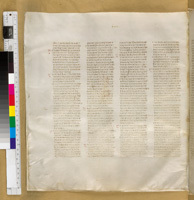 SKEAT, Scribes and correctors of the Codex Sinaiticus, London: British Museum 1938, pp.70-86. See V. KIREYEVA. Examination of Parchment in Byzantine Manuscripts. Restaurator 20, (1999), 39-47. See H.J.M. MILNE, T.C. SKEAT 1938, p.79. 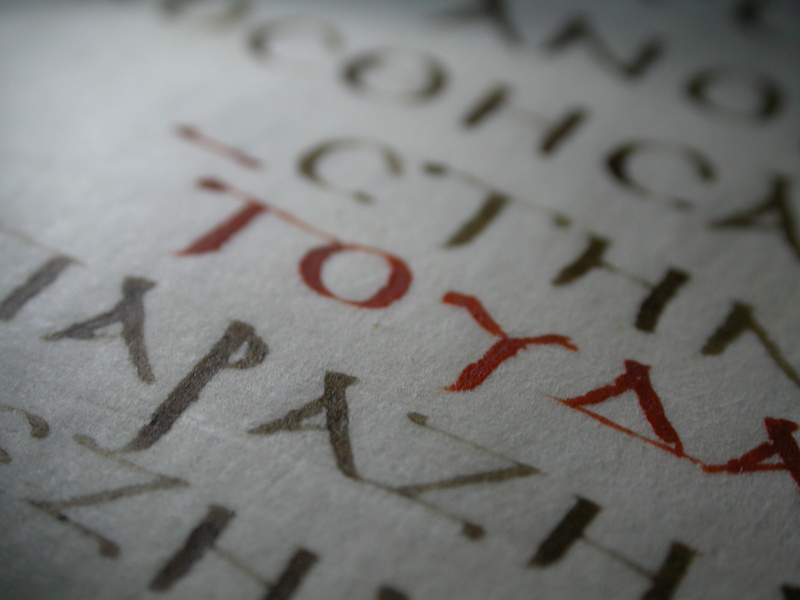 Roger Powell was able to examine Codex Sinaiticus in June 1952 at the British Museum. He did not make any particular comment in regard to the condition of the inks but he mentioned that the book must have been handled quite a lot in the previous 16 years, when the manuscript was available to be studied in UK for the first time. The black powder found in the spine folds of the bifolia may be ink flaked off as a result of the physical and mechanical strain caused by the handling. In the old images taken by Douglas Cockerell, the folia of the manuscript seem to be more aligned with each other than they appear now.